The StealthTouch-M5 is a 15" all-in-one touchcomputer powered by Intel's Atom, available up to Core 2 Duo 2.5GHz. The Stealth-M5 can be set up to run as a diskless and fanless thin client, reducing dust and grease intake, and improving the life of the terminal. Connectivity consists of Intel 10/100/1000 BaseT network, 6 USB, 4 Serials, and 24-volts poweredUSB for devices such as a printer. With its compact footprint, the M5 takes up little countertop space and can easily be mounted on the wall or VESA pole. 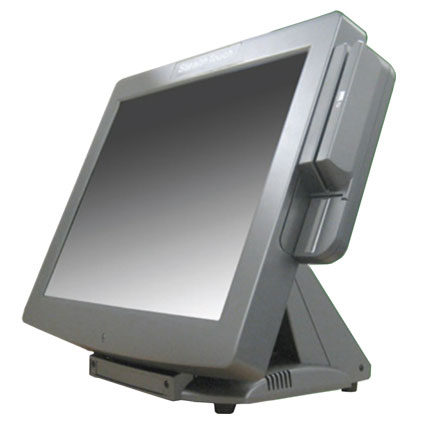 Additional features include WiFi wireless network, credit card reader, magnetic stripe reader, biometric fingerprint reader, integrated customer display, integrated barcode scanner, CD/DVD drive, privacy filter, and webcam.